Hey guys! How did the weekend treat ya? Did you watch the big game? See all the commercials that cost a small fortune to air? Tune into half time? Eat your weight in wings or nachos? I heard the other day that there’s over a billion wings eaten during the super bowl! What?! That is crazy! That’s a whole lot of chicken! What did you think of that half time show with Lady Gaga? Holy moly! Does that chick have energy! What a show! After watching, I was seriously tired and pumped up at that same time. Um, Lady Gaga? YES! So if you gorged a small bit yesterday, you may wanna flip the switch and turn on the healthy eating again. These teff energy bars will do the trick. Healthy, but with a bit of chocolate so that’s a fair compromise, don’t ya think? 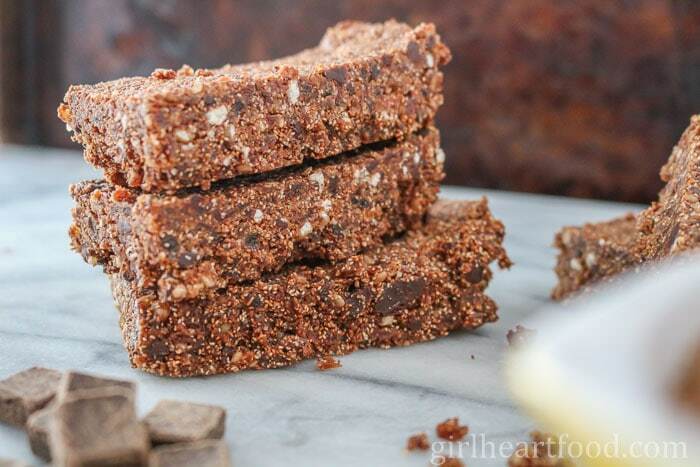 These teff bars are a huge hit in our home. Hubby didn’t even believe me when I said they are on the healthier side. He thought I put some magic in there. I asked him if he wanted some packed in his lunch and before I had a chance to finish the question, he shouted a big happy ‘YES’. So, you definitely should give ’em a try! What is Teff? What Does Teff Taste Like? So, what the heck is teff ? This whole grain goodness only came into my world as of late. I was flipping through Ricardo magazine and they had a little section saying how teff is the new super grain. You know how every now and then a food ‘trends’? Sometimes it’s kale, sometimes it’s cauliflower. Well, I thought, better not miss that train. I’m often late to the party, but not to this one! 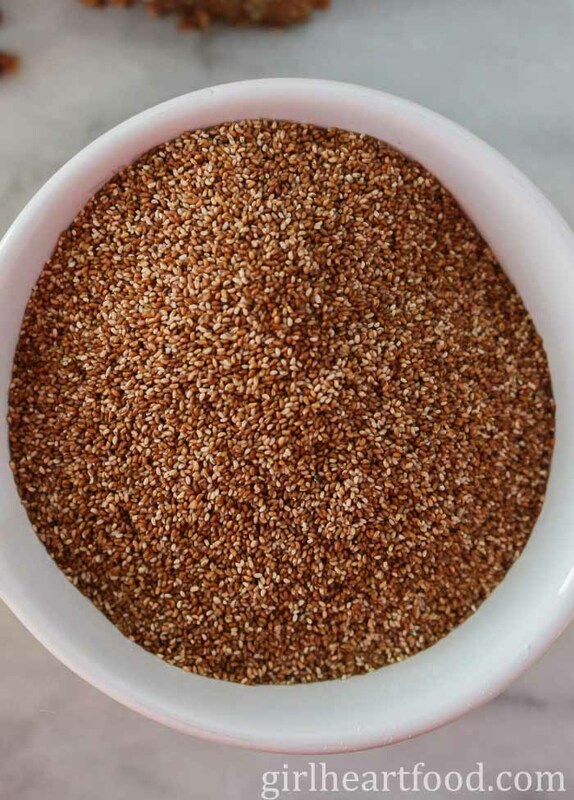 Teff is an ancient grain originating from Ethiopia. It’s grains are super tiny, even smaller than chia seeds. Even though they’re small, they’re mighty! Teff, to me, is mild in flavour and has a slight nutty taste. When used in this teff energy bars, it gives a lovely bite. Whole grain teff is something hubby and I regularly have stocked in our pantry. Why? It’s so freakin’ good! In a food processor add dates, maple syrup, almond butter, coconut oil and salt. Blend until it comes together like a paste. Next, add teff, almond flour and chia seeds. Blend. Finally, add chocolate chips and walnut and blend until just combined. Don’t overblend and lose the texture in your walnuts. Mixture will be kinda sandy, but moist. Pour mixture into parchment paper lined casserole dish. Press down hard to pack in the mixture. Use your hand or the bottom of a measuring cup. Bake in a preheated oven on 325 F for 30 minutes. Carefully remove from oven and allow to cool. Place in fridge for a couple hours (or to be speedy, freeze for a 20 minutes) before cutting into bars. 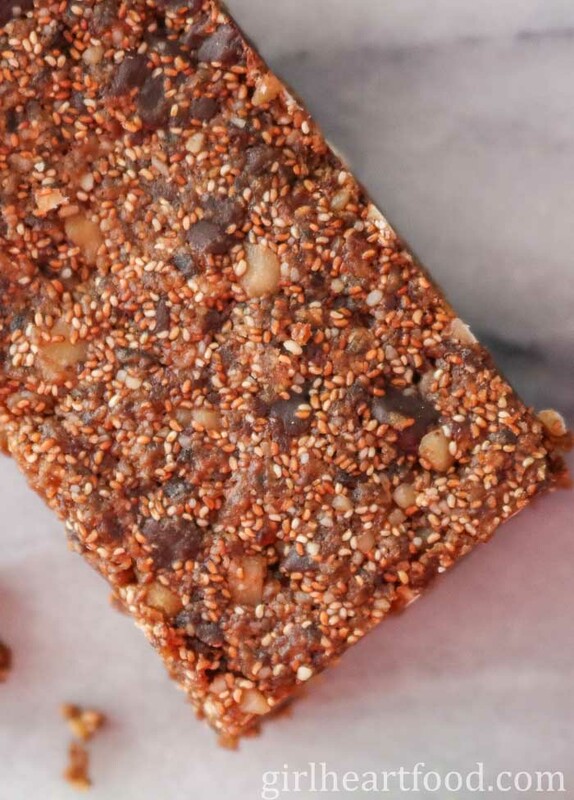 What Makes these Homemade Teff Energy Bars So Great? The prep time takes minutes so they are awesome for meal prep for the week ahead. I like to make a batch on Sunday for easy grab and go breakfasts or snacks. Use vegan chocolate to keep ’em vegan. They’re naturally sweetened with maple syrup and dates. Hope you love these teff energy bars as much as we do! These gluten free and whole grain Teff Energy Bars are LOADED with goodness! There's fibre and iron rich teff, almond flour, chia seeds, walnuts and let's not forget chocolate. It's a treat you can feel happy about eating. An energy bar never tasted so delicious! Preheat oven to 325F. In a food processor combine dates, maple syrup, almond butter, coconut oil and salt and blend until smooth, 2-3 minutes. Add teff, almond flour and chia seeds and blend until combined. Add dark chocolate chips and walnuts and blend until combined. Don't overblend and lose texture in your walnuts. In a parchment lined baking dish (I used a 8" x 11" dish), place parchment paper. FIRMLY PRESS mixture evenly down into dish and bake for about 30 minutes. Important - Let cool for about 2 hours before placing in fridge to cool for about 2 hours before cutting into bars (use sharp knife to cut into bars). Store in fridge. Cut into 12 or 24 pieces. Enjoy! Note - if you want to have them ready to eat faster, you can let cool on the counter for about 30 minutes or so before placing into freezer for about 20 -30 minutes before cutting into bars. Store in fridge. These are amazing. Do you have the nutrition facts on them? Thank you Blake 🙂 ! No, I don’t have a nutrition calculator on my site right now. Hello! Should the teff in this recipe be cooked first? These look fantastic! I’ve been meaning to try teff for ages and boy does THIS look like the way to do it. Thank you! Thanks Marissa!! I actually just made another batch yesterday 🙂 Hope you enjoy them! This is such a great idea for a snack, Dawn. I can eat this at any part of the day! Thanks Miriam! I’m on my second bag of teff already and really enjoy it! Love the texture that it gives and you really can’t beat a healthy treat that tastes good, can ya 😉 ? btw, nice nail polish. I have that same color. I did too, girl. I did too! Hahaha! Thanks ’bout the polish. We definitely like the same stuff 😉 Thanks bestie! These look great. I recently got back into swimming, and I am S-T-R-U-G-G-L-I-N-G. I have set a goal to do a triathlon, and I could use some Teff in my life. I need to give these a go! Thanks for sharing. That sounds like a fantastic goal, Cindy! Swimming is awesome exercise….little at a time and I’m sure you’ll get there 🙂 Hope you like these teff bars. They disappear no time around our house! Thanks so much! I’ve heard of teff lately as well. Have you heard of Kaniwa? I read about it being the new replacement for quinoa. I’m not sure about that, but it sure is another good grain for the kitchen recipe arsenal. I am loving it. Need to try this one out. I’ve never used teff! 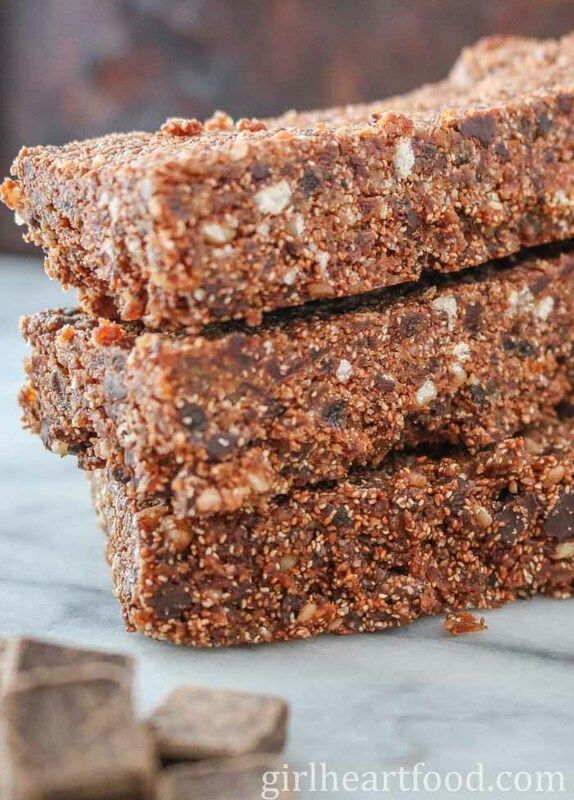 I need to get my hands on some so I can make these bars – they look so delicious! 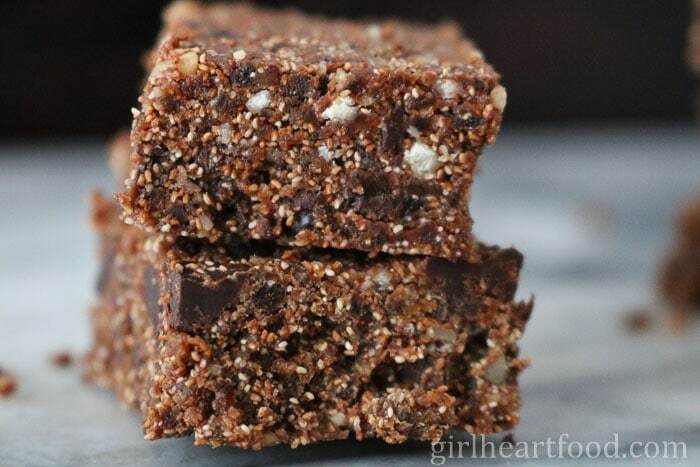 I’ve never made anything with teff, but this bars look delicious! The only thing I’ve seen related to the Super Bowl were a few of the adds, the Budweiser one and the one with the Mexican girl. I liked the message behind them. They are pretty tasty, Adina…my new favourite thing 🙂 Hope you get a chance to try them! Thank you! Oh, I was so bad yesterday. I did not actually eat the wings that were fried in this house, but I did eat the beer brats and beer cheese. Oops. I think I need some of these energy bars to get me back on track! I hear ya, Rachelle, I hear ya!! By the time I feel back to myself again, it’ll be Friday, lol 😀 What’s a girl to do when there’s just so much good food 😉 ? Thanks girl! Well that’s my word for today! It’s the first time I’m hearing of teff but hooray for every healthy new thing they discover! I’ve been experimenting with energy bars so a teff version will definitely go in there! And yes, I watched the “game” but really I just tuned in for Lady Gaga lol. I kinda want to jump off from up high like that! Happy Monday! I’m on my second bag of teff right now…love it! Lady Gaga jumping off that platform….I know, right?? I had to rewind and everything at the end when she caught the ball and just went for it 😀 Have a great week, Jolina! Thank you! These look and sound delicious Dawn. And I have a good friend who is vegan, so I’ll go with the vegan chocolate and make these for her the next time I visit! She’ll love them! They totally are, Mary Ann! I’ve made them multiple times now, tweaking here and there and they disappear in no time! I hope your friend (and you) enjoy them 🙂 Thank you! I’ve been meaning to try teff for a long time now, but honestly didn’t want to use money/time experimenting with it. I’m glad you did the grunt work for me! These look amazing. Thanks so much, Annie! I love ’em! And, seriously, your comment just made me laugh out loud. Now, I’m going to think the same thing about the word ‘teff’. Too funny!! I have never heard of teff! It certainly sounds like a grain worth trying! I love how you’ve made these bars and you were right….I overindulged yesterday. Not on wings, but on nachos! Time for something a bit healthier today! It definitely is, Kathy! We are on our second bag already! Nachos! Sounds delicious…can’t go wrong with that on game night 🙂 Thank-you!! Well, since I don’t care for either team that played yesterday we didn’t watch the whole game. We tuned in for the halftime show (because Umm Lady Gaga rocks) and then we watched the rest of the game after that. What a game! Anyways, I have heard of teff, but I have yet to use it, so wahoooo to you! Look at you all rollin with the cool kids and the new fad! 😉 These energy bars look amazing! I love the dates and maple syrup in here! These are snack-tastic, my dear! Cheers! It definitely was quite the game for sure! History made and everything! Hahaha! They are our new favourite thing ’round here for sure. We’ve been going through the teff like crazy. Thanks Cheyanne!! I love bars that have dates inside, but I’ve never used teff! This is the time to try 🙂 . Yes, I’ve heard it’s one of those super foods, Ok, I’ll jump on the train, too 😉 . They also loook pretty and decadent, so we can’t go wrong. P.s. No watching super bowl for us… Pp.ss. Pinned! I’m already on my second bag of teff. I love it! Hope you do too 🙂 Thanks so much, Nicoletta for the sweet comment and Pin! Appreciate it!! You definitely put some magic in these bars, Dawn! They look fantastic! Glad you jumped on the teff train – there’s a little South Asian store I frequent that has finely ground teff and millet flours on sale all the time and I’ve experimented with it before though everytime I make something it disappears too quick so nothing has made it onto my blog yet – such a versatile and healthy grain! You echoed my sentiments regarding Lady Gaga – phew the energy – she was non-stop – and what a fantastic performance – even though the dirty birds lost, it was a great game – and I’m not even a big football fan! Happy Monday to ya! I hope you had a great weekend, Dawn! I’m not really a football fan, so I just tuned in for some of the commercials and the half-time show, but my husband was glued to the TV haha. We didn’t go to a superbowl party this year, so I didn’t overeat too much, but I definitely need to get back on track after the weekend. I love the looks of these energy bars! I’ve never heard of teff before today, so now I’m intrigued and will be on the lookout for it. Sounds like the perfect snack! Pinned, of course! Hope your week is off to a great start, friend! No super bowl party for us either, but we did enjoy some good eats. Hubby made homemade pasta again and it was so good! I think I’m still full now, lol 😀 I found the teff in the health food section of my supermarket. Thanks so much for the kind words and Pin, Gayle! Hope you have a great week too….snowing here today!! So I’ve heard the same thing about Teff…it’s supposed to be the newest supergrain fad. I haven’t had the chance to try it yet, but I love that you jumped in with both feet and made these energy bars! How perfect are these for a Monday morning…especially the Monday morning after the Super Bowl. I definitely need to track down some teff and try these out now. Fun! Also, I totally agree with you about Lady Gaga. I found myself “dancing” in my seat during her performance last night. Talk about energy!! I found the teff in the health food section of my supermarket. It definitely has a unique texture. Lady Gaga was insane, right? So funny at the end when she just jumped off the platform. I had to rewind back and everything 😀 Thanks David!